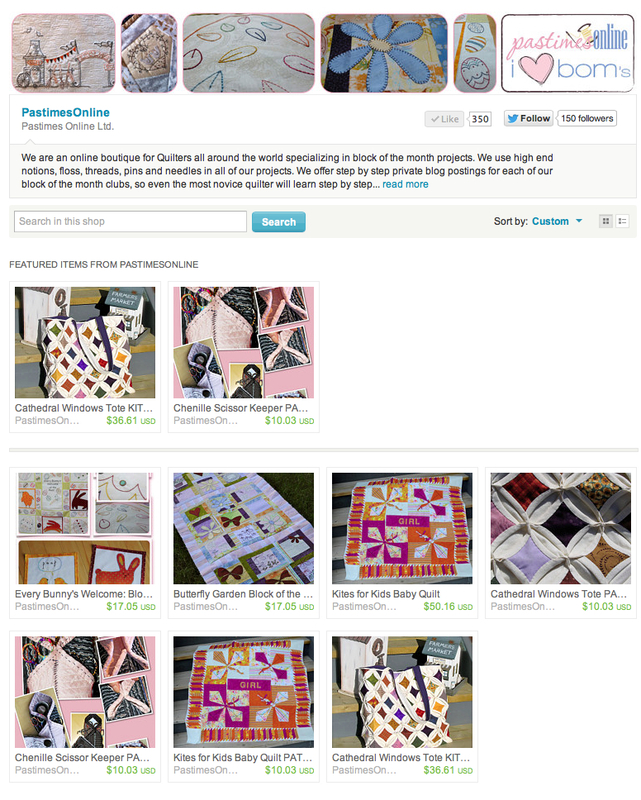 As I’m updating Pastimes Online’s reputation around the net…I’ve updated our store look over at Etsy: Pastimes Online. 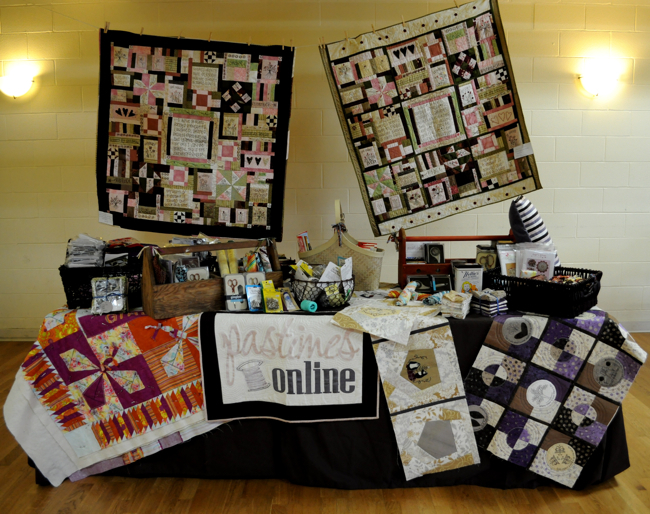 Hi all, I’m a sponsor this week over at Quilting Gallery, thanks for having me back again Michele it’s always a pleasure to meet new quilters and show them something special to me, Valerie from Pastimes Online. 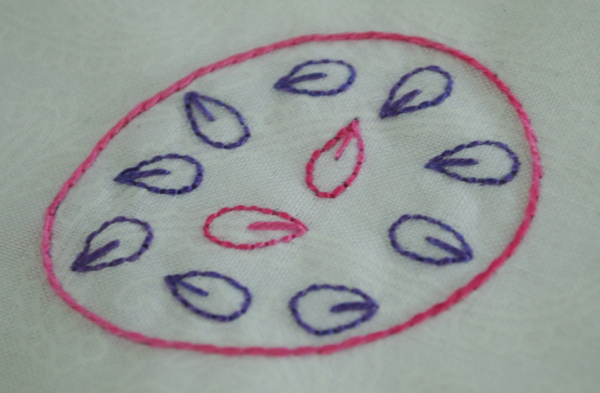 This weeks theme is embroidery, something that I only tried a couple of times a few years ago, then I wanted more and more projects that included stitching beautiful embroidery stitches – now I just can’t get enough. 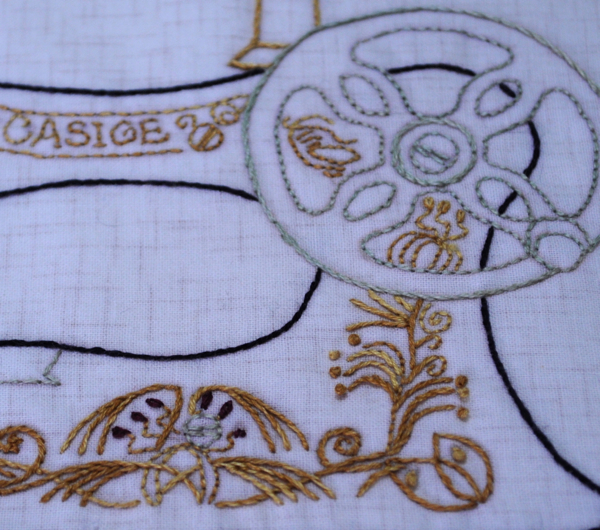 This block from our Block of the Month called Vintage Sewing Machines, using simple stitches like stem, back-stitch and french knots – well maybe a few lazy daises too. Here’s our very own pattern, Chenille Scissor & Needle Keeper showing simple backstitch, french knots, whip stitch and stem stitch. These are such a great gift idea – this one was for my mom. 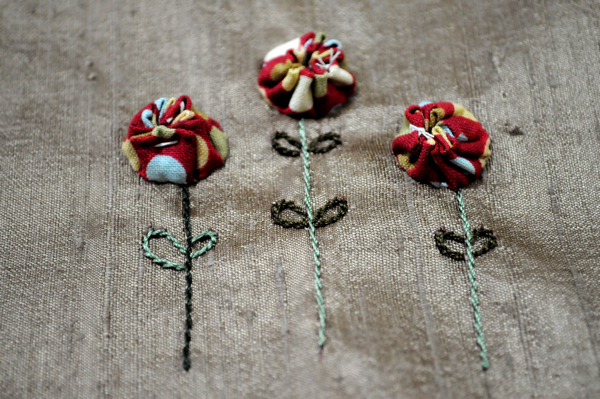 Here’s one set of flowers off of the border to our Block of the Month in 2010 called A Kittens Tale, we changed the border completing 127 yo-yos including these gorgeous stems and leaves – completed in the stem stitch. Here’s an egg from our newest Block of the Month, Every Bunny’s Welcome showing back-stitch and stem stitch – isn’t this super cute? 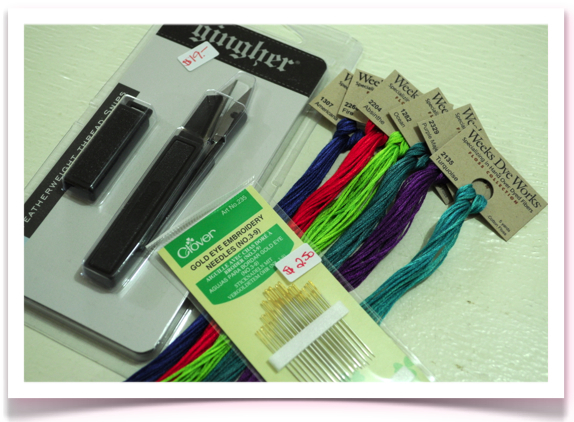 So as the sponsor this week, I’ve put together an embroidery kit including…floss, needles, and a special pair of snip scissors by my all time favourite Scissor Manufacturer, Gingher – all my most favourite things to stitch with. The Floss is hand dyed Weeks Dye Works Floss – a dream to stitch with and I just love the names of each floss – they are so perfect! The needles are what I include in every kit as they give you a good range of sizes to see which one you may like the best. As always, I look forward to your comments and sending out the prize to the winner this week – how fun! I do have a quarterly NewsLetter, The Times if you’re interested in signing up. 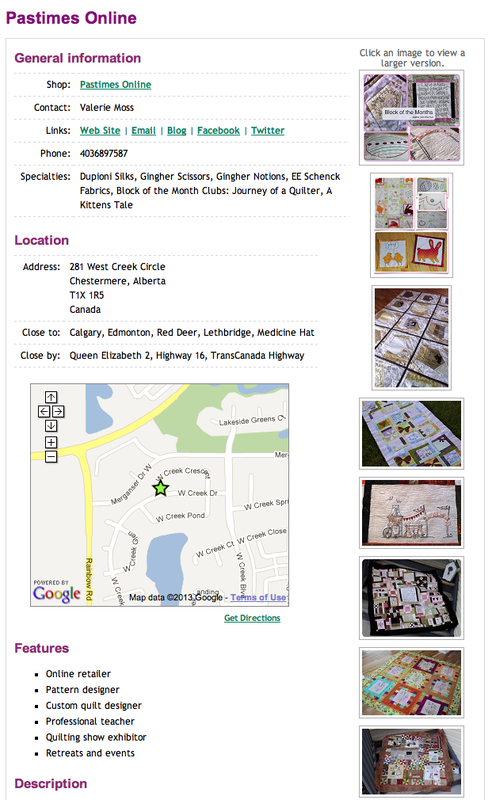 So, I’ve had the pleasure of being invited to speak and do a trunk show for the Sherwood Park Quilt Guild. That’s about 4.5 hours from me…I’m super excited, honoured and looking forward to it. My friend and fellow Facebooker Bradie Sparrow from Sparrow Studioz invited me to come and show my goodies to her and her guild. I’m a little nervous to be honest but I’m thinking, just be myself and be prepared and it will all turn out, right? Jeff’s going to be away that day so I’m going to be packing up London and goodies, bringing her with me – always keeps me grounded – do you feel that way about your kids? It seems like having her around me makes me feel humble and grounded, and I do love that feeling. A constant reminder that there’s more important things in life besides…well most other things except people we love, am I right? So I am planning my talk, and I’m going to speak about how and why I started Pastimes Online, what my motto is – do YOU know what my Motto is? Well Jeff left on Monday and I was pretty much ready to go on the Saturday because with an 8 month old it’s hard sometimes to be able to budget your time (like even to write this post) and ensure you’re prepared. So packing up these projects as well as myself and daughter took a bit of extra planning and time – but I got it done with the help of my Sister (Gold bless her). Left here in plenty of time Thursday, went to deliver some packages at the post London was just about to go down for her morning nap..all good – she slept the entire way to my Mums which is about 2.5 hours from here. Unpacked her lunch, her and me – then we all went and had a nice lunch. Change her and I nursed her – packed up what we needed for our 1.5 hr trip and proceeded on our way…..
That’s when London decided she didn’t want to have an afternoon nap or didn’t want to be in her car seat (what did you kids think about their car seats?) or was trying to push her top 4 teeth through – Yep this 8 month old now has 6 teeth! or whatever else she was trying to deal with…well to make this a story worth reading she cried the whole way…1.5 hours – oh it was grueling. I was driving and Mum was helping with London – thank G for her too!! We finally ended up pulling over in Sherwood Park and I took her out – she was fine!! Yep even laughing…oh man – lol what do you do she’s just too cute for words. Well she eventually settled, my Mum spent the time with her for her supper and while I was speaking…and she did great!! I spoke about all 9 of my quilts and a few of my classes thus far like: 1) Journey of a Quilter by Leanne Beasley 2) A Kitten’s Tale by Lynette Anderson 3) Hocus Pocus Ville by Crabapple Hill Studio 4) Life is Beautiful by Hugs and Kisses 5) Crazy Christmas by Lynette Anderson 6) Truly Scrumptious by Cinderberry Stitches 7) Pies and Tarts by Sue Daley 8) Vintage Miniature Sewing Machines by Ella and Skysie Designs 9) Butterfly Garden by Leanne Beasley which was only the first block as well as Quilt Aid, some of my class projects and more…I hope I don’t over stay my welcome lol but I’ll be pretty excited to show my projects and our goodies PLUS I’ve packed up quite a few giveaways..I can’t wait to update you on my special day – well it’s a Speaking Engagement, yep I like the sounds of that. They clapped, asked questions, ooohhh and awwed and really wanted to get to know me and my business – I spoke to Bradie and she said the VIBE was good throughout the room…there was about 80 women there! So in the end the day was FAB-O even London slept all the way home, we stayed at Mums and had a FAB-O time! 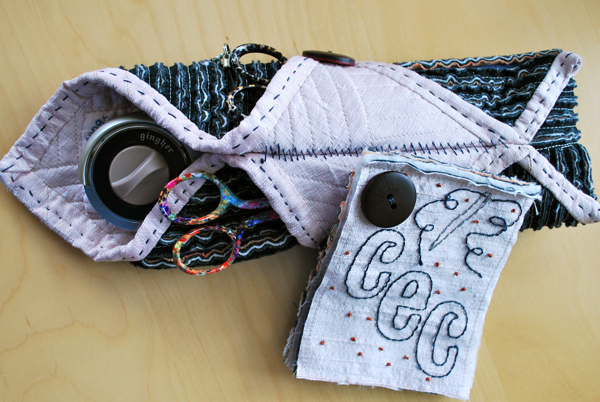 Hi, I’m Valerie (you can find me here on most days) and I LOVE to Quilt! 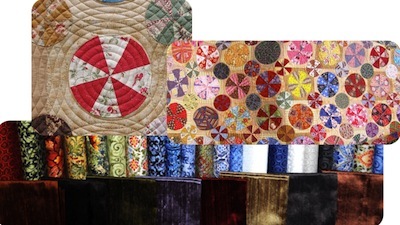 I most especially LOVE Block of the Month clubs as they are an excellent way to make a stunning quilt by creating a new block each month while learning a barrage of techniques as you go. 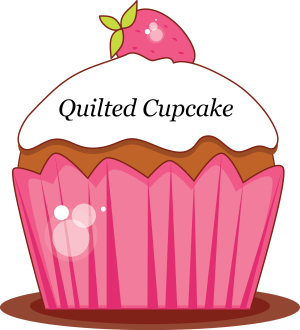 My Block of the Month Club programs teach with private step by step how-to video blog and picture tutorials weather you’re a beginner or an advanced quilter, my tutorials are an excellent way to start your skills and hone them and I will show you how, sound fun? 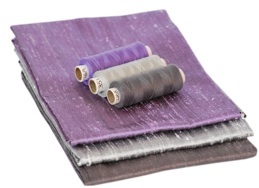 Pastimes Online provides you everything you need to get started, silk pins, sewing machine needles, 100% cotton hand dyed floss and wool, 100% silk floss and luscious dupioni silks…sound enticing now? We are about to launch a new array of block of the month (bom) clubs from beginner to advanced. One of these will suite YOU! Each bom will include all of the above plus prizes (i.e. scissors, rulers, fabrics) each month. 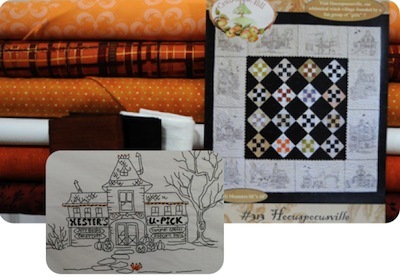 Help us pick which ones YOU would LOVE to do by Voting through our Block of the Month Poll!! 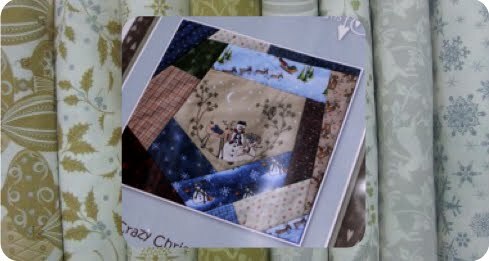 Crazy Christmas by Lynette Anderson, 12 month bom, quilt as you go, to include stitching & the cutest Christmas wool applique within a crazy patch design. Life is Beautiful by Hugs and Kisses will be set in the mood of creams, browns, lilacs and purples, with an interesting applique & quilt as you go technique. A ‘beautiful’ journal pattern including all the blocks. HocusPocusVille by Crabapple Hill was one I just couldn’t resist. Starting with the amazing drawings that will be stitched in veriegated flosses, and the adorable 9-patches will be perfect to hang during the fall. Pies and Tarts by Sue Daley is one that is just stunning, with the overwhelming beauty combination of the curves and piecing. This will sure to be a show stopper. 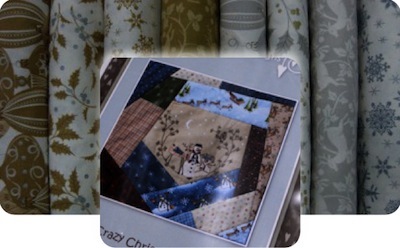 English paper piecing technique will be mastered throughout this process. 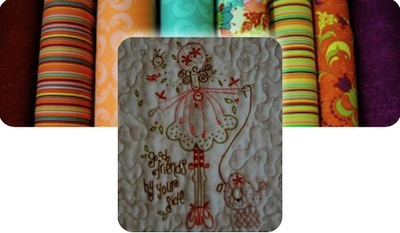 Acrylic templates, paper templates and more included in this kit. 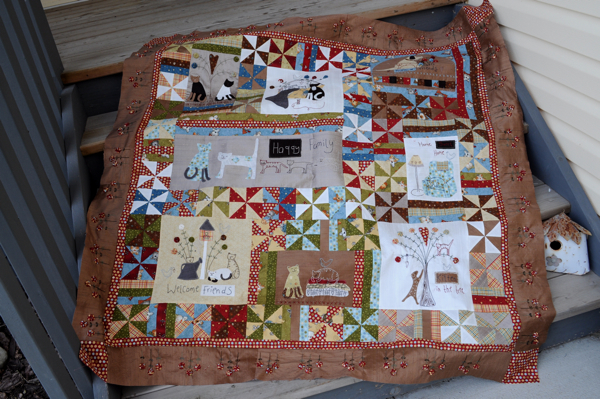 Truly Scrumptious by Cinderberry Stitches is the most adorably whimsical piece of patchwork and embroidery I’ve seen, this will look amazing in any hallway, or bedroom making it joyful and happy. So I want to say, “thanks so much! 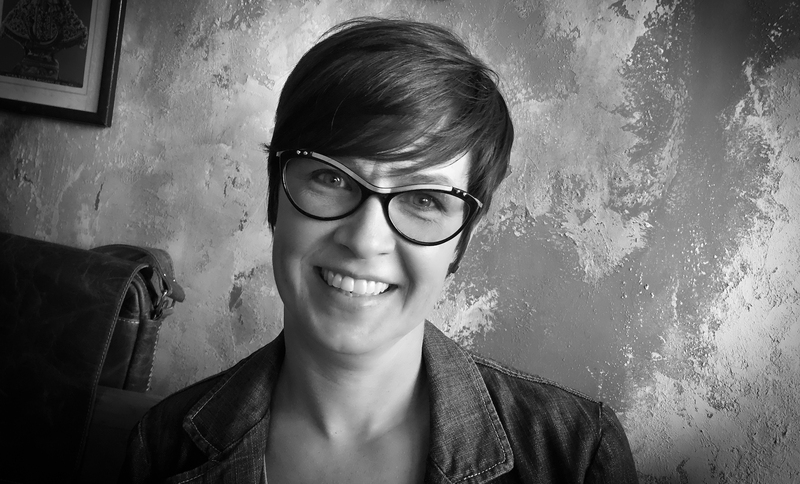 !” Madame Samm for having me spend the day here with all of your wonderful viewers in this fantabulous community of quilting, sharing and loving each other up so much!! I’ve had a great time and would love to come back and chat about my favourite cutting tools including the desirable Gingher line of scissors, Gingher’s unbelievable rotary cutter and sew much more on my next visit. 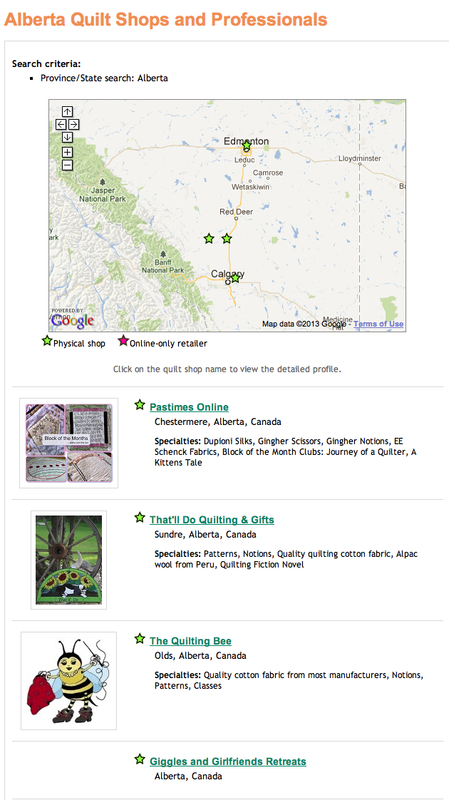 If you need a fix or want to read up on Pastimes at www.PastimesOnline.ca, and sign up for our quarterly newsletter, The Times!